I love creating holiday pieces and making fun and unique party favor boxes is one of my favorite things to do. This month Eileen Hull's Inspiration Team has been asked to create party project for the holidays. So all I can say is make sure to check out Eileen's Blog and Sizzix to keep up with all the fun filled projects that will be shared all month long. I began my Hocus Pocus Halloween Candy Stash Box by first cutting out two Loaf Pan using mat board. Form one as shown and the other cut off 1" on all sides and then form the lid. Paint with black paint including a 2 1/2" x 4 1/2" piece of mat board. Die cut pattern paper and adhere to loaf box bottom, lid and extra mat board piece. Die cut Lost Zombie from mat board. Adhere all mat board pieces together. Die cut zombie from pattern paper. Adhere to top of mat board zombie; ink with distress ink using blending tool. Die cut zombie two more times to form clothes. 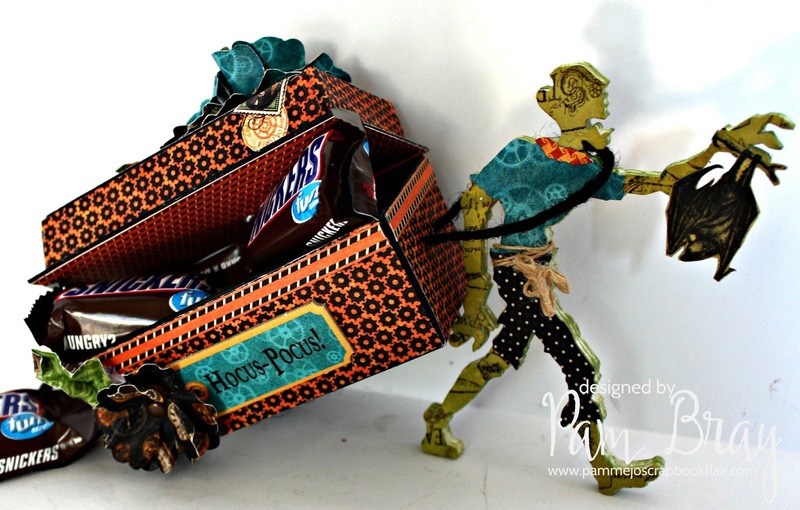 Dress your zombie and tie twine around his waist. Fussy cut bat from pattern paper; adhere to zombie hand. Die cut Pansy Flower and Spring Leaves from pattern paper; adhere to top of coffin lid. Add fussy cut stamp images to top of coffin lid. Add chipboard to front of coffin. Adhere one pansy flower and leaf to front of coffin. Punch hole in the end of the prepared coffin. Add black jute to form handles. Place handle of one side of coffin over the shoulder of zombie so it is tilted up. 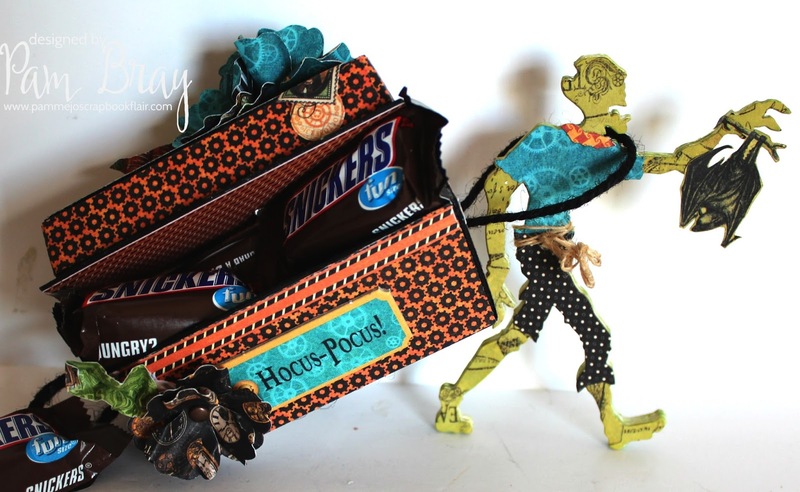 I just love how it looks like the zombie has his Hocus Pocus Halloween Candy Stash in tow. I hope I have inspired you to start making some fun and fabulous party projects!!! 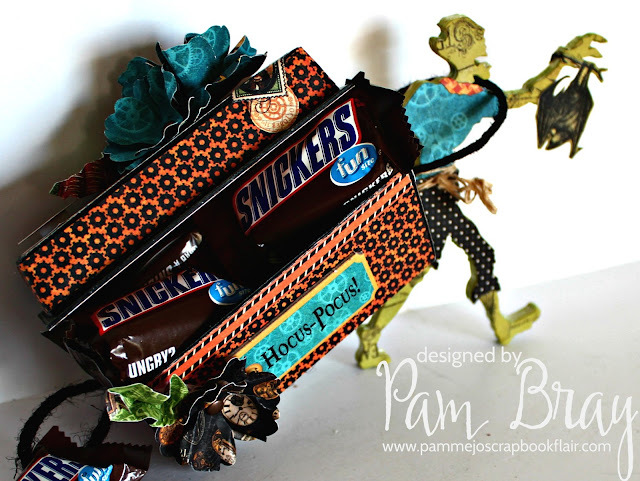 OMG what will you think of next :-) I love this candy coffin Pam! What a goulishly fun little candy coffin you created Pam! LOVE it!